“Appearance of the Jeweled Lotus” by Daphne Arthur makes its debut at The First Global Radical Relevances Conference. 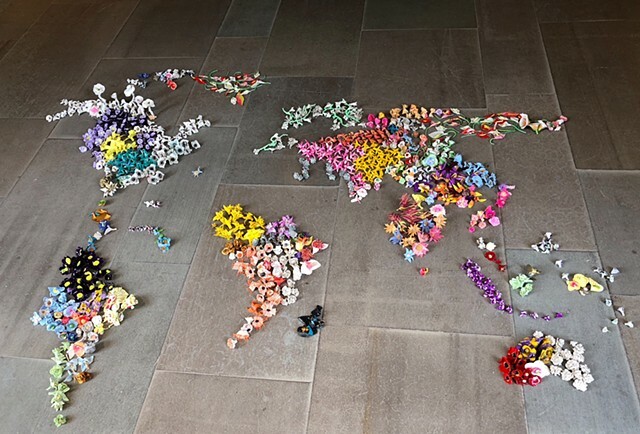 Partially developed during her residency at MASS MoCA and her New York City studio, the 3.5x3 meters floor installation of the world map created by one thousand uniquely handmade polymer clay flowers will be given away to audience members. Each flower is an imaginative rendition of flora that exist in the world, capturing the diversity seen throughout her travels in South America, the Caribbean, Europe and India. A colorful spectrum of seductive beauty creatively immerses a contemplative and subtle acuteness of hope as nature’s way of promoting pollination and sustenance. As participants carry a piece of the world with them the world map shifts form and eventually disappears raising awareness of an ethereal liminality that governs our global experience. “Mono no aware” and ideas of compassion from Buddhism and the Lotus Sutra are underlying philosophies for this piece where empathy and altruism reflect the sympathy towards the ephemerality of things. The three-day event and exhibition at Aalto’s Otaniemi Campus in the Learning Center, BETA space, and Otakaari 1X, April 25-27 2018 will present more than 70 Contributors in this Transdisciplinary conference with essays, artworks, workshops, and performances. Radical Relevances conference aims to go beyond the rational in order to touch the emotional in addressing complex global phenomena of our time, such as climate change, biodiversity, income inequality, and mass migration. These wide scale problematics demand focused, sustained, and transdisciplinary academic discussion. How can we engage in new ways of thinking about and practicing in terms of human and nonhuman co-existence and flourishing in the midst of vast predictable and unpredictable planetary transformations?